In a bid to address low levels of physical activity associated with later life, London Sport piloted an initiative with older adults in two London boroughs: sitting netball. As much as the title may seem a little strange (sitting and playing netball?! ), this pilot created an environment that led to more active care home residents, smiling, laughing and having fun. With data showing lower engagement with physical activity among older adults in London, our aim was to help more people from within this population segment to get active in care home environments. Often in grassroots sports development it is difficult to find affordable facilities, a suitable coach and an inactive population in the same place, but in care homes all three are apparent. They have free space, staff already delivering activities (Activity Coordinators) and a resident population that is likely to be inactive. Moreover, nursing and residential homes, as well as sheltered housing, are under increased pressure to provide meaningful activities and individualised care. That’s where sitting netball comes in. Following a small-scale pilot in Brent, for which London Sport won an England Netball Inclusion and Diversity Award, we sought opportunities to expand the project further. With the support of England Netball, Harrow Council and Barnet Council, we were backed to introduce sitting netball into 10 residential homes across Harrow and Barnet. We hoped that through the inclusion of sitting netball on the activity timetable, we would increase the level of physical activity undertaken by residents; resulting in improved cognitive functioning, physical wellbeing and mental wellbeing. Encouragingly, by the end of the 8 week sitting netball programme, 98% of residents were doing at least one physical activity session a week, compared with 62% at the start. All Activity Coordinators involved reported a positive change in their residents: 66% of residents had an improved mental wellbeing, 79% felt close to other people often or all the time, and the percentage of people feeling optimistic more than doubled. Please refer to the graphic below for further outcomes. But what brought about these positive changes? Sitting netball is social. Unlike independent exercise, passing a ball relies on other people’s engagement. This means that participants have to work together, as a team, which helps to create ways for residents to enjoy shared goals and outcomes. While working together, residents are encouraged by positive comments from Activity Coordinators, as well as from each other which grow into cheering, rounds of applause and laughter, providing something for residents to bond over. Furthermore, this shared experience and togetherness helped to spark conversation. Residents were talking about the session itself, about who scored or played well, as well as reminiscing about the ‘old days’, stimulating positive nostalgia. Another factor that was commonly mentioned by Activity Coordinators as a key contributor to positive emotions was self- fulfilment. If we take a contrasting activity, walking for example, numerous coordinators commented that individuals can become bored or restless without a specific focus, or an ability to demonstrably progress and advance. Sitting netball on the other hand, provided participants with an ‘aim’: to throw a good pass or score a goal; something to focus on, the ball and their teammates; and, ultimately, a skill to improve. These focuses helped to positively influence individual development. Residents must think about how to throw the ball or the sequence they are practicing, requiring concentration and mental stimulation. It was particularly noted for those with dementia, that in that moment of throwing the ball, they are engaged; something that can be challenging with dementia patients. Ultimately, for all participating, sitting netball helped to improve their sense of achievement, boosting their confidence and self-esteem. Despite the clear successes of the pilot, it is important to note limitations. Although the game is adaptable to both capacity of staff and capability of residents, activity provision is an increasingly challenging aspect of residential care. Activity Coordinators felt that it was important to have two people delivering the activity to increase the number of eyes on residents and prevent staff anxiety. Sometimes movements had to be restricted due to the size of chairs as well as the space available. As well as adapting to these capacity and logistical issues, the game had to be altered depending on the ability of the residents, both physically and mentally. For example, while many Activity Coordinators noted that the competitive element was positively challenging, others found splitting into separate teams one step too far for the reduced information processing ability of some residents. This highlights that sitting netball is not a ‘one size fits all’ game, but an inclusive activity that should be adapted to suit those participating. However, no matter the culture or capacity of the home, the budget or restraints and the capabilities of the residents, it was clear how sitting netball made participants feel. Having the opportunity to connect, keep learning and be active, made them feel good. Regardless of the stage of life, everyone deserves the opportunity to get active and experience the associated benefits. At London Sport, we are trying to get 1,000,000 more active by 2020. We believe in getting to improve the health and happiness of the capital… and sitting netball is one tool to help achieve just that. To see the full impact evaluation and accompanying infographics, please click here. Emma Butterworth is an Insight Officer at London Sport with a passion for understanding consumer behaviour and evaluating impact in order to continually improve and drive positive societal change. 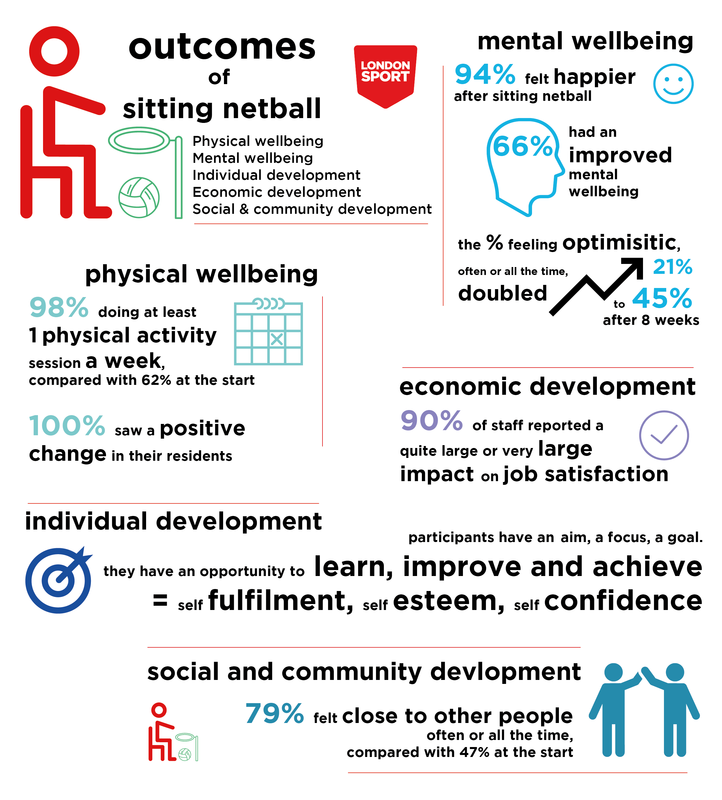 In collaboration with the London Sport Relationship Management team, England Netball, Harrow and Barnet Council, Emma conducted a primary research investigation to explore the impact of sitting netball.